USES: This product is used to treat moderate acne. It helps to reduce the number of pimples. This medication is a combination of 2 drugs. 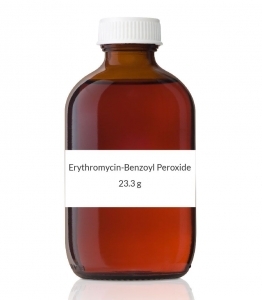 Erythromycin works by stopping the growth of acne-causing bacteria. It belongs to a class of drugs known as macrolide antibiotics. Benzoyl peroxide also kills acne-causing bacteria and causes the top layer of skin to dry and peel off so that new skin can form. This product also contains alcohol which helps to dry extra oils from the skin. HOW TO USE: Read the instructions for use that come with this product. This medication is for use only on the skin. Before applying, wash the affected areas thoroughly, rinse with warm water, then gently pat dry. Apply a thin layer of this medication as directed by your doctor, usually twice daily (in the morning and in the evening). If you are using the individual pouches, you must first mix the 2 medications from the separate compartments of each pouch. Mix the contents thoroughly in the palm of your hand. Apply the product immediately after mixing. Wash your hands after using medication. Avoid getting this medication in your eyes or inside your nose, mouth, or other mucous membranes. If this occurs, rinse thoroughly with water. Do not mix or apply medication near an open flame. Benzoyl peroxide may bleach hair or colored fabrics (such as clothing, bedding, towels). Use caution when applying this medication near the hairline. Use this medication regularly to get the most benefit from it. To help you remember, use it at the same times each day. Do not apply large amounts of this medication, use it more often, or use it for longer than prescribed. Your condition will not improve any faster, and your risk of side effects may increase. Acne usually improves after a few weeks of treatment. However, it may take 2 to 3 months of continued use to notice the full benefit of this product. Tell your doctor if your condition does not improve or if it worsens. SIDE EFFECTS: Mild dryness and mild peeling of the top layer of skin is expected. Skin irritation, itching, burning, or redness may occur, especially at the start of treatment as your body adjusts to the medication. Eye irritation and skin discoloration may also occur. If any of these effects persist or worsen, stop using this product and tell your doctor or pharmacist promptly. Remember that your doctor has prescribed this medication because he or she has judged that the benefit to you is greater than the risk of side effects. Many people using this medication do not have serious side effects. Rarely, use of this medication for prolonged or repeated periods may result in other types of skin infections (such as fungal infections). Contact your doctor if you notice any unusual skin symptoms or if your condition does not improve. A very serious allergic reaction to this drug is rare. However, seek immediate medical attention if you notice any symptoms of a serious allergic reaction, including: rash, itching/swelling (especially of the face/tongue/throat), severe dizziness, trouble breathing. This is not a complete list of possible side effects. If you notice other effects not listed above, contact your doctor or pharmacist. In the US - Call your doctor for medical advice about side effects. You may report side effects to FDA at 1-800-FDA-1088. In Canada - Call your doctor for medical advice about side effects. You may report side effects to Health Canada at 1-866-234-2345. PRECAUTIONS: Before using this product, tell your doctor or pharmacist if you are allergic to erythromycin or benzoyl peroxide; or to other macrolide antibiotics (such as azithromycin, clarithromycin); or if you have any other allergies. This product may contain inactive ingredients, which can cause allergic reactions or other problems. Talk to your pharmacist for more details. Before using this medication, tell your doctor or pharmacist your medical history. This medication may make you more sensitive to the sun. Avoid prolonged sun exposure, tanning booths, and sunlamps. Use a sunscreen and wear a hat or other protective clothing when outdoors. Before having surgery, tell your doctor or dentist about all the products you use (including prescription drugs, nonprescription drugs, and herbal products). During pregnancy, this medication should be used only when clearly needed. Discuss the risks and benefits with your doctor. It is unknown if this drug passes into breast milk. Consult your doctor before breast-feeding. DRUG INTERACTIONS: The effects of some drugs can change if you take other drugs or herbal products at the same time. This can increase your risk for serious side effects or may cause your medications not to work correctly. These drug interactions are possible, but do not always occur. Your doctor or pharmacist can often prevent or manage interactions by changing how you use your medications or by close monitoring. To help your doctor and pharmacist give you the best care, be sure to tell your doctor and pharmacist about all the products you use (including prescription drugs, nonprescription drugs, and herbal products) before starting treatment with this product. While using this product, do not start, stop, or change the dosage of any other medicines you are using without your doctor's approval. Other skin products (such as cosmetics, medicated soaps, after-shave lotions, products containing alcohol) and other acne skin treatments may increase skin irritation, dryness, and peeling when used with erythromycin/benzoyl peroxide. Ask your doctor or pharmacist about what products are best for you, what products to avoid, and ways you can reduce skin irritation. This document does not contain all possible drug interactions. Keep a list of all the products you use. Share this list with your doctor and pharmacist to lessen your risk for serious medication problems. NOTES: Do not share this medication with others. For best results, this medication is often used as part of a total skin care program. Follow your doctor's recommendations. STORAGE: If you are using the individual pouches, store them at room temperature between 68-77 degrees F (20-25 degrees C). If you are using the premixed product in the container, store in the refrigerator between 36-46 degrees F (2-8 degrees C). Do not freeze. Keep the container tightly closed. Discard after 3 months. This medication is flammable. Keep it away from heat and open flame. Keep all medicines away from children and pets. Do not flush medications down the toilet or pour them into a drain unless instructed to do so. Properly discard this product when it is expired or no longer needed. Consult your pharmacist or local waste disposal company for more details about how to safely discard your product.